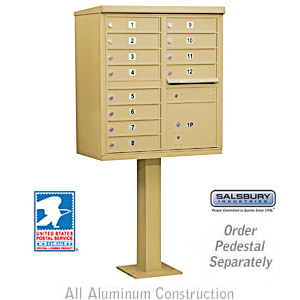 In numerous cities throughout the country, cluster mailboxes are incredibly popular. In place of having a wall mounted mailbox on the buildings or a rural mailbox, cluster mailboxes are put throughout the community and residents have to go to one central location to gather their mail. While it might be a little bothersome for residents to walk to their cluster mailbox area, it does allow mail carriers to deliver to fewer locations. There are even many regions of new construction where Cluster Box Units are required. Though it may be possible to design cluster box units in residential housing neighborhoods, it is more difficult because of the design of the areas. Townhouse developments and mobile home parks are designed to cater to centralized mailboxes while other kinds of building are less accommodating of the design of cluster boxes. Like any other mailbox, cluster mailboxes must meet specifications set by standard USPS Regulations. These regulations may change in individual states and even cities, so it’s crucial for you to check with your local post office if you are a builder or developer working on new residential or commercial buildings. Just be sure you know and understand the regulations for your community before you make a selection on the type of mailbox you’d like. Be sure to know whether your community must have cluster mailbox units and if so, where they should be placed. While they offer benefits, one of the principal advantages is cluster mailboxes are cheaper. While this is not necessarily the case-there are cluster boxes that cost over $1,000-you can easily find many much cheaper. Of course, the more units you will need, the more expensive the cluster box will be. Additionally, if you are seeking a higher security model it will cost more as well. The key to lowering costs is choosing only the volume of boxes you will need though you may want to plan for the future if you have a housing development still in the construction stages. You should also choose the least expensive (not necessarily the “cheapest”) material but the right one for the job. Moreover, since you are talking about a “cluster,” there is no need to worry about colors, especially if you will need to pay extra to “match” the color scheme of the commercial or residential complex.